I saw the news that Japan has fallen into recession again. This “hit the wires” just after the Bank of Japan surprised everyone and announced a major new quantitative easing (QE) program. Japan is a country of 127 million persons (2013) with one of the largest economies in the world, as this chart shows. Basically, though, the Japanese economy has been a start/stop mode since the mid-1990’s. According these GDP estimates, China surpassed Japan 2008-2009, and now in nominal terms has a production level twice that of Japan. The data are from the World Economic Outlook database (IMF) and are not inflation-adjusted, but are converted into US dollar equivalents. Well, a person In Kansas might say, “So what?” Why is Japan important? 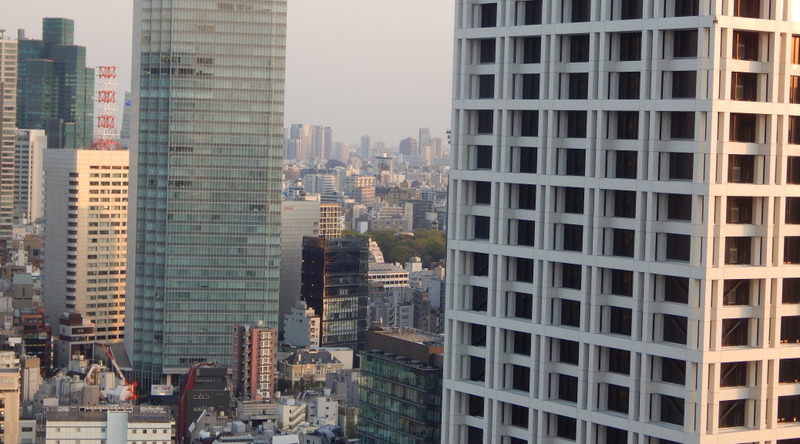 First, a recession in Japan, because of its continuing economic size, has the capability of affecting global markets. 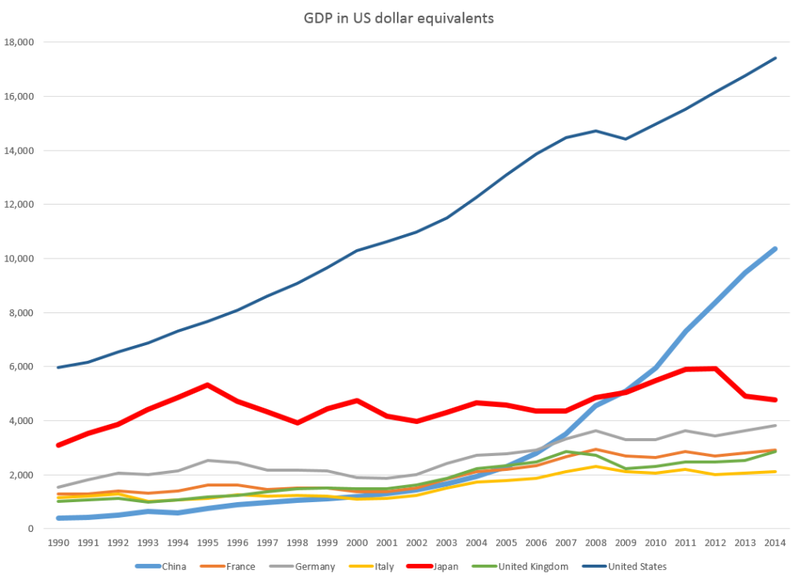 According to the CIA Factbook .. on a purchasing power parity (PPP) basis that adjusts for price differences, Japan in 2013 stood as the fourth-largest economy in the world after second-place China, which surpassed Japan in 2001, and third-place India, which edged out Japan in 2012. Simultaneous recessions in Japan and Europe almost surely would trigger a global economic slowdown, unless the American consumer just went crazy. Another reason Japan is important is as a sort of test case for macroeconomic policy, as well as for the impacts of an aging population. 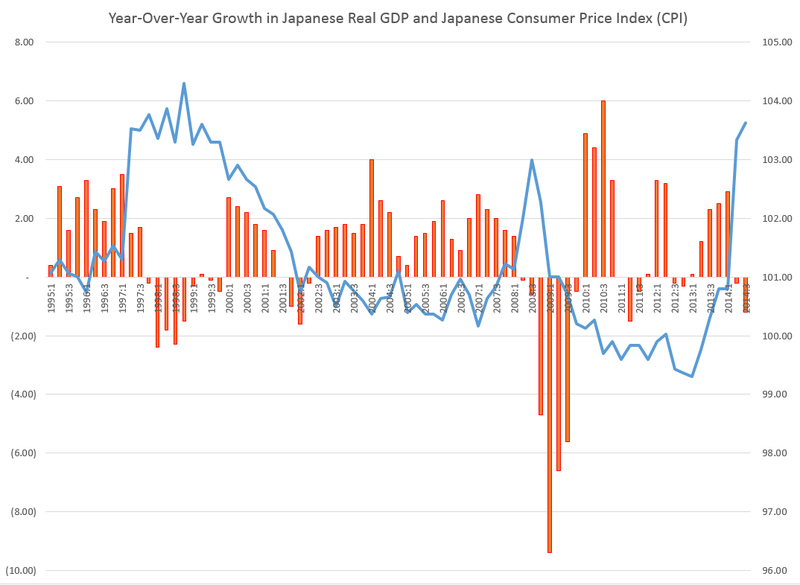 This chart shows the intermittent economic growth in Japan since the 1990’s along with the deflationary trend. These figures are developed from official Japanese statistics. Notice that you could start at around 1999 and draw a trendline for the Japanese CPI to about 2013, where a brief period 2008-2009 would appear as a blip away from this trendline. Deflation has been a twenty year phenomena in Japan, and the current government, under Abe, has sought to break its hold with a triple-threat of fiscal policy, monetary policy, and structural reform. The result is a continuation of the climb in the liabilities to GDP ratio of the Bank of Japan (BOJ), as shown in this chart extracted from Bloomberg sources. 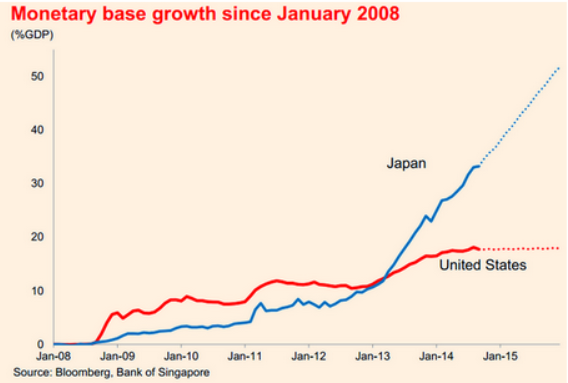 So “steady as she goes,” the monetary base of Japan will reach about 50 percent of Japanese GDP within a year or two. This compares with a figure of just less than 20 percent for the United States. The swing into negative growth in 2014 was triggered by a substantial increase in the VAT or value-added tax in Japan, and there is vigorous debate about future increases – viz Krugman Japan on the Brink. I wonder whether it might be better to question the religion of economic growth, than to attempt “structural reform” aka reductions in the real wage. In any case, it easy to see that the recent surge in Japanese inflation, combined with additional consumption taxes and, indeed, negative economic growth mean that Japanese real wages are being reduced in real time here. Indeed Edward Hugh documents this with reference to official Japanese statistics. On the one hand, reductions in the real wage could make domestically produced Japanese goods more competitive in international markets. On the other hand, domestic purchasing power could suffer, or, at the least, there could be a move to increasing concentrations of wealth. We’ve certainly seen that in the United States, where the real wage of workers has declined off and on, since 1971, compensated for, to an extent, by the entry of women into the workforce and two-wage households. The limits of human intellect can be found right here. The enormous production growth in China has been accompanied by choking air pollution which, I can assure you from personal experience, is simply amazingly bad sometimes. Health-threatening. Yet the Chinese naturally want to expand their productive apparatus to the extent they can, for purposes of providing for their vast population and in order to secure China’s place in the global economy. But life in Japan – during these decades when economic growth has been very intermittent and prices have dropped – life has been fairly good. That’s one reason why many Japanese are now starting to enjoy their older years in a degree of relative comfort unimaginable one or two generations ago. Maybe some Japanese visionary can come up with a sequel to Herman Daly’s steady state economy idea – a kind of reverse mortgage for an entire economy perhaps.